We invite you to our Gallatin Gateway Getaway. This warm & cozy house sits on a private half acre property with sunset views of the Tobacco Root mountain range. This spacious 3BR/2 BA home is remodeled and features brand new everything. The kitchen is well-equipped with essentials for gourmet cooking. Make your Montana memories right here at GGG. Perfect for fly fishing/ski visitors and MSU events. Here’s everything you need to know about me: I love being outdoors. I’m a hunter for the money shot. I live to travel. I believe riches come from experiences, not things. I’m half country-boy, half city-slicker. I'm not always politically correct, and I’m known in fishing circles as “The Trout Whisperer”. It is important to me to live everyday to the fullest, because you never know what’s around the corner. I love adventure, travel, great food and good friends, preferably all at once. What I'm after can't be purchased. I'm blessed with three amazing, smart and beautiful daughters, and a caring, intelligent and handsome son. My wife is not a one in a million kind of girl. She is a once in a lifetime kind of woman. Life is too short to have just one dog, so my two Australian Shepherds accompany me on most of my outdoor adventures. Never underestimate the power of a sloppy kiss and a wet nose on a bad day. I was born in California and lived in a small copper mining town in Arizona from the age of 10 until I was 17. Both places I consider my home, but today I live in Bozeman, Montana, where the lifestyle matches my love for the outdoors. I have an older brother and two sisters. All of us are very different and each of them have chosen unique paths in life. My father was my hero and my mother is a very honest, independent and spiritual soul. I'm a serial entrepreneur and love creating things. I currently am involved in two startup companies and maintain a boutique creative agency. This property is special because of its privacy and central location to Bozeman, the Gallatin Gateway, Big SKy, Bridger Bowl and Yellowstone. It's perfect for visitors who are visiting the area to get the experience of living in Western Montana, yet having all of the creature comforts of a cozy, warm home. Behind the property is agricultural land owned by MSU and you are surrounded by six different mountain ranges. You have sunset views of the Tobacco Root Mountain Range. We provide two complimentary guest passes to Bozeman Hot Springs during your visit. There is a garage available to keep your vehicle out of the weather or to store items like skis, fishing rods, drift boat, rafts, etc. Less than 10 minutes from downtown Bozeman. The property's back yard is agricultural farmland owned by Montana State University. Property is surrounded by multiple mountain ranges, including the Bridgers and Tobacco Root. Your own one car garage. We had a great stay at this well-maintained and well-appointed property. The sleeping arrangements for our group of six were perfect. The property is just a bit out of the town but we liked that. It is convenient to numerous restaurants and shopping opportunities. The kitchen is very nice and well stocked with utensils necessary to prepare about anything you would desire to prepare. We would definitely stay here again in the future. The vibrant city of Bozeman offers a variety of activities and attractions, and the property's wonderful location will grant you easy access to all of them! Venture into downtown to explore delicious dining options, adorable shops, the local farmer's market and expansive breweries. Check out an abundance of musical performances, along with exciting seasonal festivals held year-round! Vast outdoor activities offer endless possibilities for fun, including hiking and mountain biking trails, skiing at the famous Big Sky Resort, and fishing in the local rivers and lakes. If you're up for a small road trip, drive a short 25 minutes to Bridger Ski Bowl or a scenic hour-long haul to Yellowstone National Park. 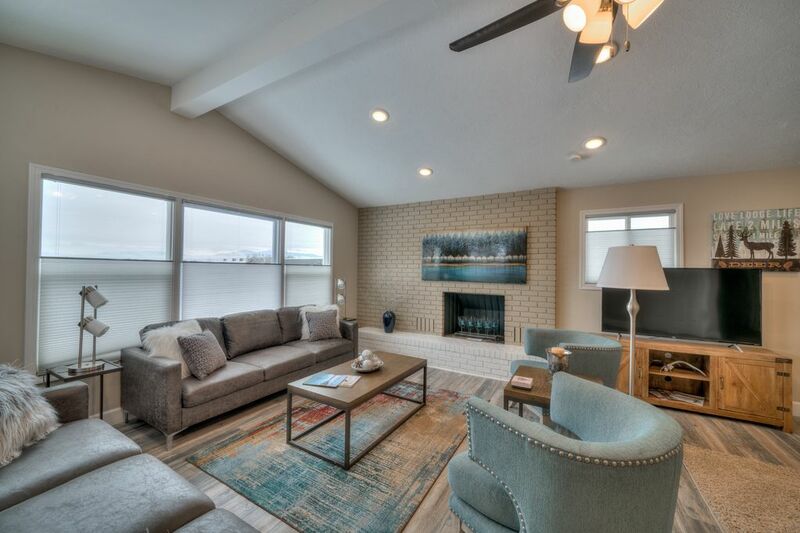 No matter how you decide to spend your time in Big Sky Country, this special Bozeman vacation rental house will make your Montana retreat all the more enjoyable.